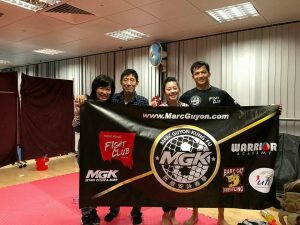 Just CKF (MMA) Hong Kong 2 happened on Friday 16 March 2018. Last minute changes in the fight card brought me to be the main event, and the bout resulted in a controversial split decision win for my opponent. First of all, let’s make things clear: Who is to blame? Or at least, who am I blaming? 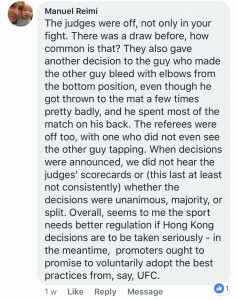 Not the promotion, they are not responsible for the fight management, which was in the hands of HKCMMA, with their own referees and judges. Not my opponent either, I have nothing personal against him. He got the split decision win, fair play to him, and if I were him I would also be happy about it. I do not know whether he is surprised of getting the win, or if he truly believes he deserved it, but anyway this doesn’t matter. What I am completely outraged about is the complete amateurism of the HKCMMA team although everything looks professional. 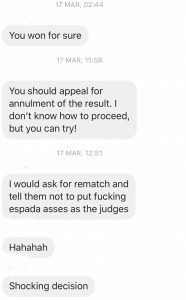 They partnered with some German MMA organisation, I am not sure which one, but I know one of their judges gave me the loss, and one of their referees wasn’t even able to see a tap to a guillotine choke in one of the other fights, and had to ask his colleagues what to do although both fighters had already stopped fighting. The worst example is of course the refereeing of my fight. 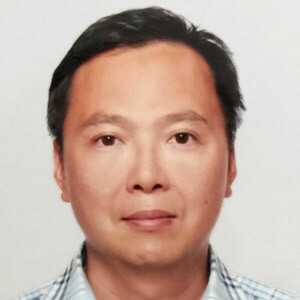 I do not like to blame the person himself, because I’ve known about him for many years, I have no intention to discredit him, and I know he a recognised BJJ instructor and MMA referee in Hong Kong. But can I just say nothing and close my eyes on the obvious mistakes he made during my fight? 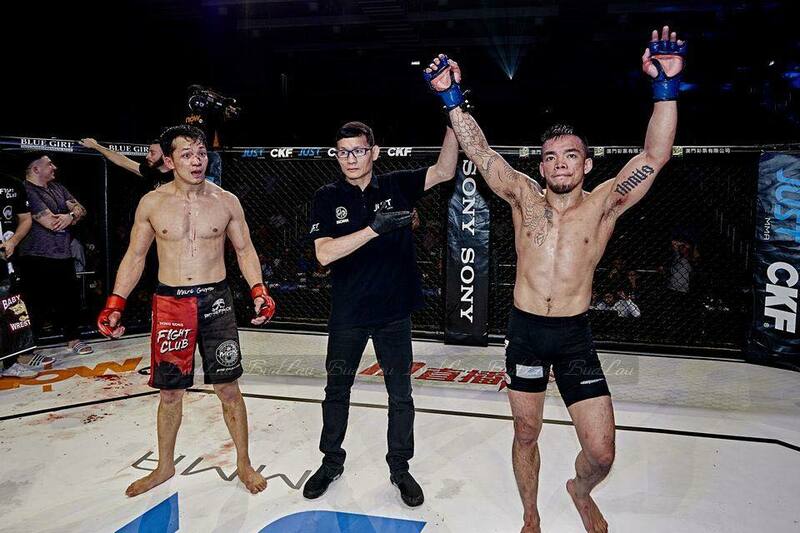 He asked us to stand up without warning while I was on mount position, he constantly asked me for action while I was already busy keeping my opponent grounded and switching positions, and he even asked me to let go my hands while I was locking my opponent in a double leg close to the cage, thinking I was holding the cage. Anyway, bad refereeing happens, and we have many examples of match results in many sports which have been determined by the bad and unprofessional work of referees. What can we do? I was unlucky, it happened to me at my disadvantage. But even though the referee was bad, what can we say about the result? Can’t the judges at least see what’s happening and take this into account in their decision? I lost by split decision, although I thought I was winning. One of my bad habits is to try to finish my fights in the first round only, and if I do not manage to reach this objective, I tend to analyse the round and change my strategy. If I know I am winning the first round, my conclusion is that I am the better fighter and I can just take it easy and take this fight to the decision. I know what you think, this is not what I should do. And I do not intend to do it. It’s the opposite, I know this is a bad habit I am trying to work on. Anyway, I know this fight was not the most exciting one, I know I was mainly trying to take my opponent to the ground and stay on top, I was somehow stalling and letting the time go on until the decision, thinking I was winning. I knew he had some good ground game and BJJ, but so do I, and I didn’t believe his grappling was good enough to submit me. 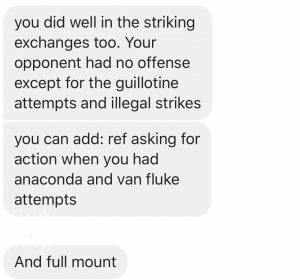 But could I guess the judges would give so much credit to his failed, completely inefficient guillotine attempts the whole fight, and his little strikes from the bottom including illegal strikes? I didn’t put on a very exciting show, but does this justify the loss? Should the judges’ decision be so unfair that I lost by split decision even though I was on top and controlled my opponent the whole fight? 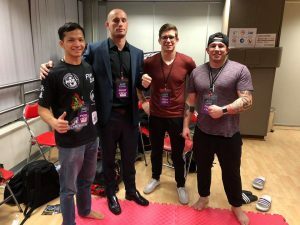 – Michael Wachter – German MMA Federation, Co director. WMMAA certified referee & Judge. – Michael Chung – Instructor Coach HK Shooto. HKCMMA Judge. The record of the score cards per round of each judge and the Bout Summary can be found in the attachment. First of all, if you have watched the fight, can you honestly believe I lost the first round? This was the only thing I was 100% sure of winning, even after the fight. I believed the 2 judges out of 3 who gave me the loss, gave me at least a first round win. Even a very few people around me (who don’t do MMA and don’t understand much about it) who believed my opponent won or that the fight was more like a draw, told me they believed I won the first round, and probably lost the 2 others. One of the judges even gave my opponent a 30-27 win! Who the hell is he? “Instructor Coach HK Shooto”, I am wondering whether he has had any MMA fight experience in his life and whether he coaches MMA, in which case I’d like to come watch what the classes look like. If I knew the level of judging after the first round was so bad, that 2 judges already gave me the loss for that round, my strategy would have been completely different. But well like I said, I can also blame myself for not looking to finish the fight. This whole experience only motivates me further to change completely my fighting style and looking only for the finish in my upcoming fights. The finish, nothing else. I can’t leave anything in the hands of judges anymore, in this new sport, especially in Hong Kong. 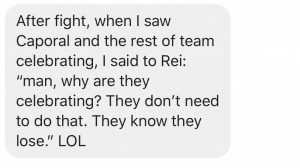 The only thing that makes me feel better are the opinions of my team mates and friends, who of course are not impartial, but they are real professionals, pro fighters and they know what MMA is, contrary to these amateur judges and referees. At the end of the day, a loss is a loss. But sometimes a loss can feel like a win. My wish now is to settle this in a rematch. I have nothing against my opponent, but I will prove that most of the judges’ decisions were wrong and that I am the better fighter. Here are my thoughts. What do you think ? 1) In the 1st round, the referee suddenly asked us to stand up while I was on mount position, without even warning and asking for action. 2) My opponent repeatedly threw downward elbows, without receiving any warning from the referee. 3) When the fight was paused for doctor check, the referee did not ask my opponent to go to a neutral corner. 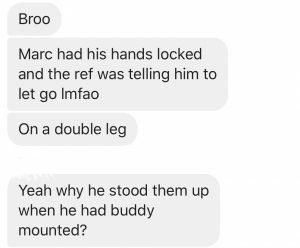 4) The referee was constantly asking me for action even when I just switched to a new position like anaconda choke set up. He even asked me to let go my hands locked in double leg, just because I was close to the cage! 5) Takedowns and ground control : I was on top the whole fight and my opponent was not able to stop any takedown. 6) Cage control : I was putting pressure on my opponent the whole fight especially against the cage. 7) Agressiveness : I was more agressive also in the striking exchanges, my opponent being mainly agressive while on his back and with a few illegal strikes. 8. This one is only a question : Who were the judges ? What are their names, and are they related to any fighter or fighter’s gym in any way ? After discussion and going through the fight video and rules, the committee concluded the result will remain for the bout between [Roberto Medalla vs Marc Guyon] at JUST CKF – Hong Kong 2 on March 16th, 2018, at Wan Chai Southorn Stadium Hong Kong. The result of the bout ruled Roberto Medalla won via Split Decision (29-28, 30-27, 28-29). For the scoring criteria, please refer to the The Unified Rules Of Mixed Martial Arts 2017 that is currently followed by UFC and other organizations (also attached). In conclusion, the bout result of [Roberto Medalla vs Marc Guyon] will remain as originally announced.